This article is a step-by-step instruction for getting started, if you are a rookie in WordPress. Below are several options that may assist you, in case if you need help along the way. Pick the red pill and join us in the WordPress world! WordPress is a great tool. It is flexible, quite powerful and easy-to-use. Creating a website, as well as managing it is an piece of art and science that needs preparation. It is important to be well-informed on the subject in order to be ready for this. Your time investment is the most important thing, while your knowledge will save much time in the long run. So there are readings to help you get started, before you invest your valuable energy and time into installing WordPress. Do you want to make a test site to see how it works, or will you install WordPress in the root directory, subdirectory right away? To organize your content by groups, you have to make a list of your website categories. Do you have it? Have you got a list of Pages such as About, Events or Contact, you may want to add to your website? Do you know what will be in the header of you website? Have you created a list of topics to start blogging, and a content strategy? Have you developed a plan how to integrate social media into your WordPress website and workflow? If you complete your installation, it is time for WordPress setup. Check out the Administration Screens guide to understand how all the various screens and features on the WordPress Administration Panels work. Also, see Users > Your Profile pages for guidance on creating your user profile information. Go to Administration > Settings > General, to set the site name and other information. Just a few clicks needed to change the look of your WordPress site. 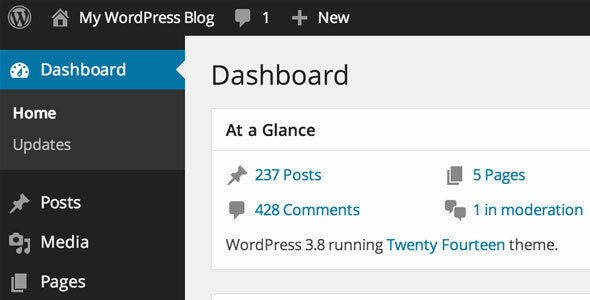 WordPress Widgets can quickly add more content and information to your Theme. If you need WordPress custom-made theme created according to your requirements, it is better to find qualified web designers on the Web or in your local community. Once you became a full-fledged user of WordPress, you may consider contributing to WordPress Support Forum, Development, Codex and other volunteer efforts, where your help might be needed. WordPress is a free community, which is totally supported by volunteers, so we all should keep it going.